Losing The Race But Winning Gold – Run. Ride. Roam. On your marks…get set…wait for it…wait for it…steady there in lane 2, I can see you weaving…get seeeet…GO! The grudge match was on – cyclist versus the rain. Rain was forecast to strike at 10:00am, so we set off in a race to beat our nemesis, heading for a campsite at Heybridge, near Maldon. It was only going to be a 26km ride, so we hoped to get there, or most of the way there, before the pesky rain arrived. 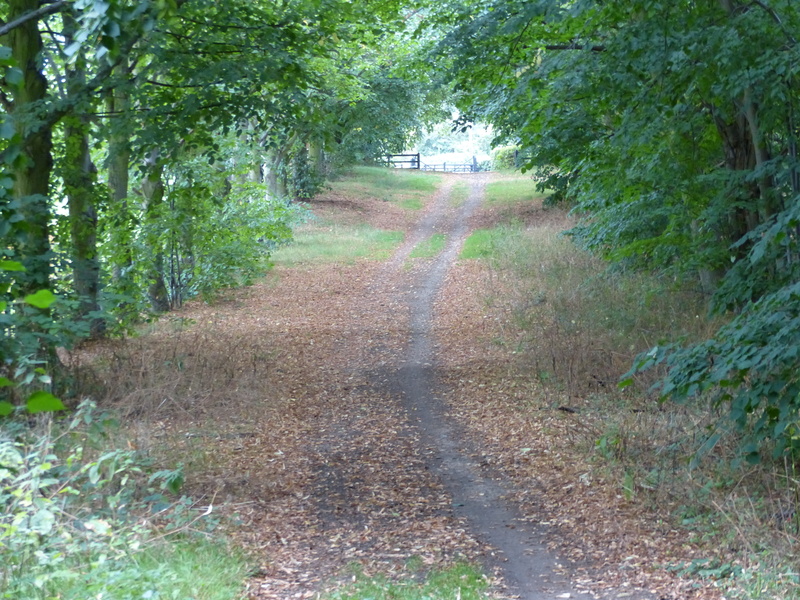 We pedalled along the off-road route out of Chelmsford and were making pretty good time. Racing…racing…racing…then…we lost. That pesky rain cheated, didn’t play by the rules and took an unfair advantage by arriving early. That’s not playing fair. We were riding in the rain again. There was something different about this ride in the rain though – it was fantastic! Beautiful. Gorgeous. Wonderful. “Rain or no rain, I love this!” I called to Steve up the road as we pedalled along. “It’s beautiful today,” came his reply back down the road. Yep, it was a beautiful ride, simply delightful. We were on country roads and lanes again, pretty quiet with minimal traffic and the avenues of trees, cottages and countryside was simply exquisite. It was a golden ride, just gold. We were following the route markers that would take us all the way to Maldon and as we rode along an off-road path, we saw one of the markers, with an additional sign beneath it. We wheeled around the corner, with Steve in the lead and he whizzed onto the bridge, only to go…crunch! 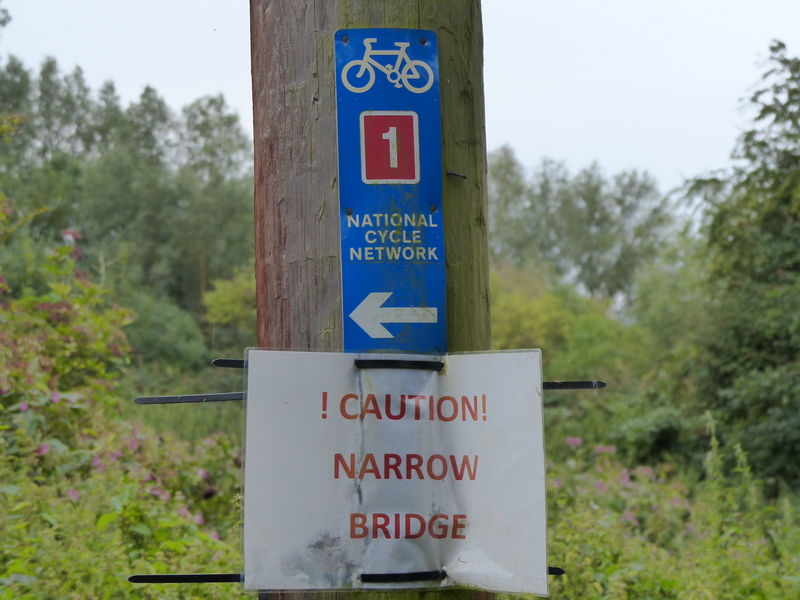 The bridge was indeed narrow and Steve’s fat, sticking out bike, crunched straight into the sides and knocked off a pannier. There was a reason for that extra sign! Beware all ye who ignore the signs! 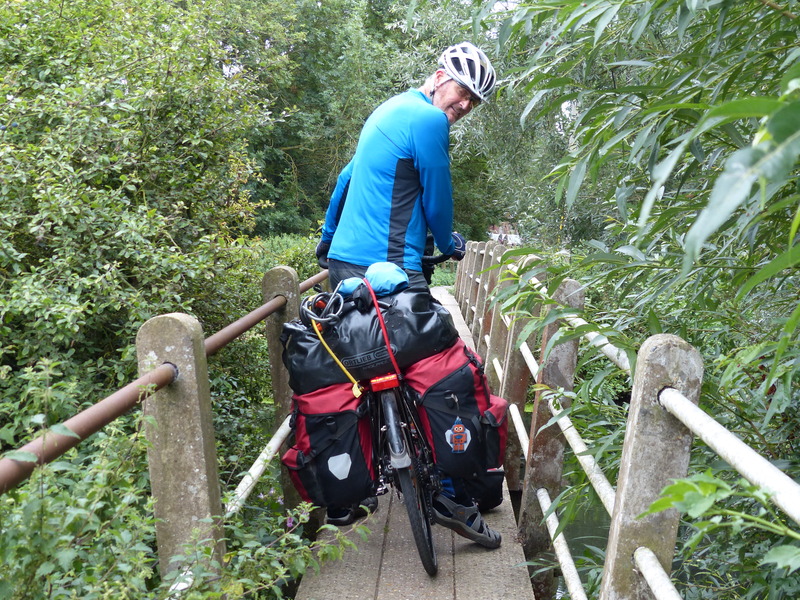 Steve picked up the pannier, reattached it and rode along that skinny bridge a little more cautiously. 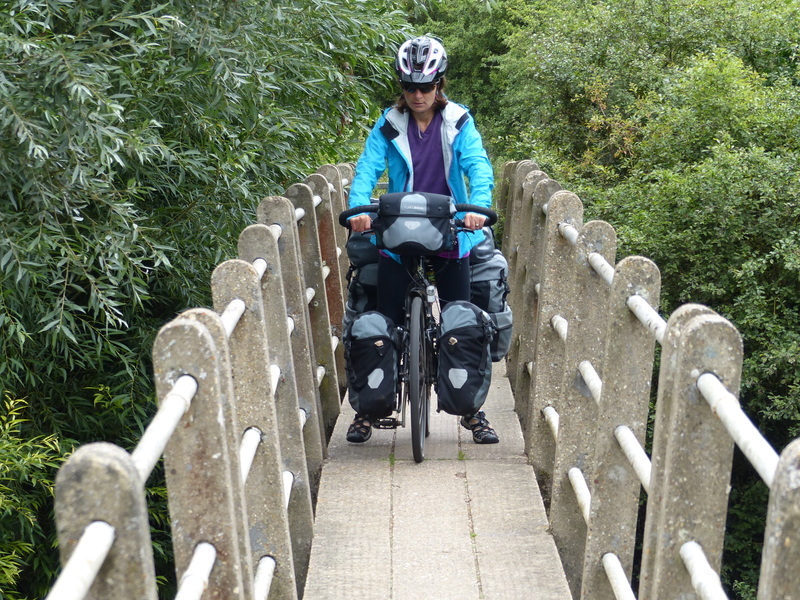 I followed along, doing the ‘toe-dance scoot’ with feet on the ground and inching the bike along that teeny weeny bridge. 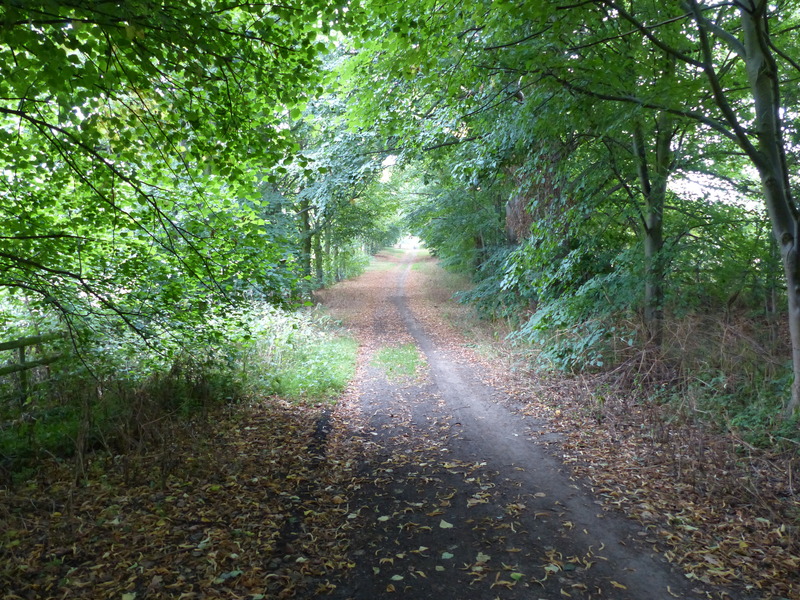 The golden ride continued with beautiful scenery and tree lined roads. We even had sheltered sections to ride along, because the trees were so dense they provided a ceiling against the rain. It was a super ride. The pedals turned and the wheels rolled into Maldon. 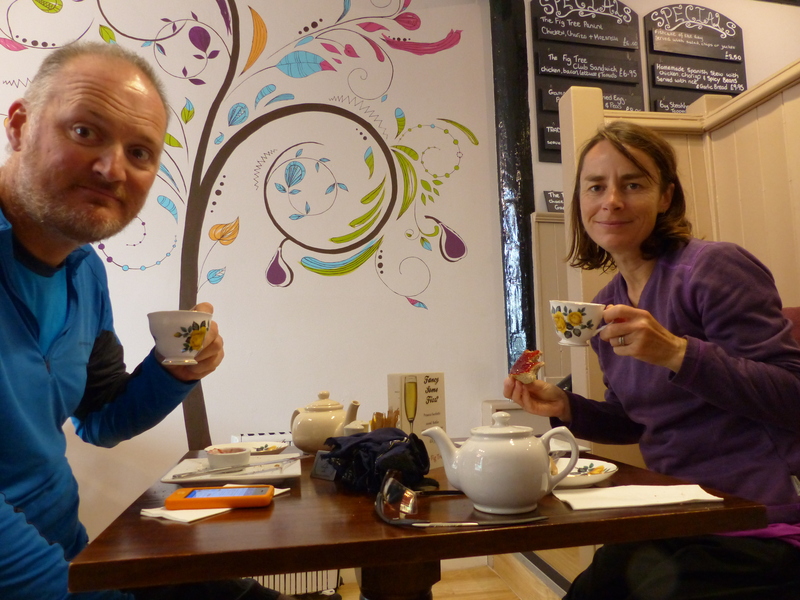 We rode past a tea room, with a small awning outside, so decided to stop and seek some shelter for a while and have elevenses at the same time. We parked the bikes outside and Steve sat at an outside table, under that little awning, while I went inside to order. I was a bit worried about our fat bikes, sticking out onto the footpath though. “Are we in the way there?” I asked the lady behind the counter. “I wouldn’t have thought so, but you can bring the bikes around to the back garden if you like,” she offered. She gave directions to the garden via a lane way up the street and we walked the bikes around and then sat in the lovely little tea room, all to ourselves, and had elevenses out of the rain. Another lovely local, offering assistance. 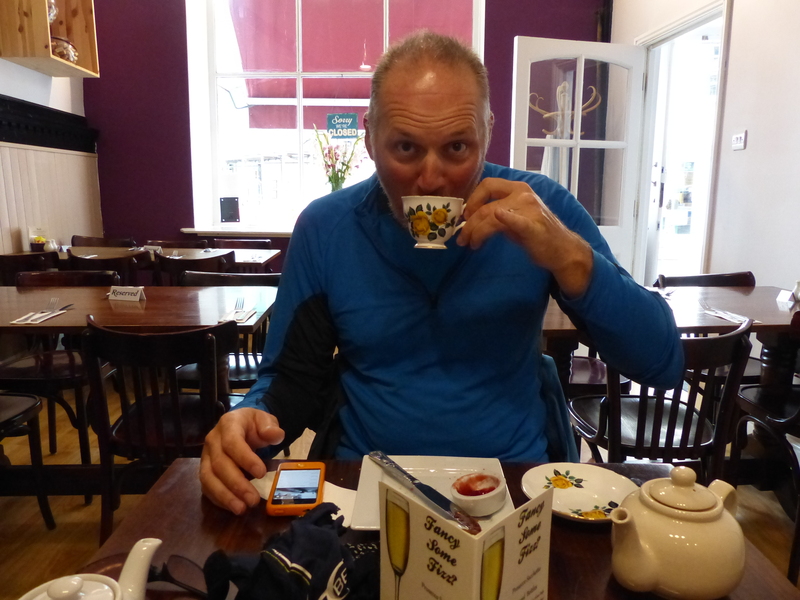 Steve perfecting his English gentleman routine with his china cup and peppermint tea. He’s mastered that pinky finger! As we enjoyed our tea and toast, we looked out the window at the rain getting heavier and began to question our original plan to camp. We could pitch in the rain and then sit it out, as long as it stopped over night, which it was supposed to. Still, we were feeling pretty soggy and began to wonder if this was an appealing prospect. When the lady served us, she said, “I can’t believe how much the temperature has just dropped. It’s freezing!” So it wasn’t just us, who were finding this less than summer type weather. We researched some possible solid wall options and found a place not too far away. We tossed up whether to not to splurge on yet another hotel and this one, although the room was half price on the booking website, was a fancy schmancy one, so we thought this way and that about the budget. Decision made, we set off again into the rain, heading for our sheltered destination at the Crowne Plaza Resort at Tolleshunt Knight. After a few wrong turns as we tried to find the route markers again, we were on our way out of Maldon. We stopped at a supermarket to pick up supplies, in case there was nothing close by to our final destination, then off we went again. We had another short stop in a park to add some more layers. I added a fleece, Steve added his fleece and some long legs, and off we went again. The temperature reading on my Garmin was showing 12C and Steve’s was showing 13C, so it was in that general range of chilliness. As we left Maldon, we rode through another roundabout and this time Steve had a close call. A car did exactly the same thing to him, as the car had done to me, when it ran into me. We were both in the roundabout, we both had our arms sticking out, signalling that we were going around the roundabout, when a car came across on our right and cut straight in front of Steve and sped off out of the roundabout. It was the exact same manoeuvre that the other car had done to me. Thankfully this time, there was no contact, but it was very close. Finally, the busy traffic ended, and we found ourselves again in the beautiful Essex countryside. The temperature had dropped and I was showing 11C and Steve was registering 12C, so it was wet and quite nippy and now the wind had decided to join the party too. This had zero effect on the enjoyment of the ride though, it could not be diminished by some rain, wind and cold because the scenery, cottages, villages and woods were just too delightful. I did manage to make myself extra wet though. I kept riding too close behind Steve and taking the full waterfall of spray off his back wheel. My fault for getting too close, but I did laugh at my foolishness, as I shook off the extra water that had landed over me, as if I needed to be even more soggy than I already was! Steve called out to pull over. He said he was feeling a bit shaky, so thought a bite to eat might help. We pulled into a small shelter by the side of the road and Steve self-medicated with some bread and honey. We weren’t too far from our destination now, so we didn’t stop for an official lunch and decided to hold out for a slightly more comfortable and drier alternative. A few kilometres later, the sign to our pitstop came into view – Crowne Plaza Resort Five Lakes. It was almost in the middle of nowhere and we pedalled down the long drive, past the golf course and up to the front of the resort. I waited with the bikes and Steve went inside to check in. He soon returned with a slightly uncomfortable look on his face. “It’s a bit posh,” he said. “Well’’, we’re about to lower the tone of the place,” I said. I have to say, I did feel very scruffy and bedraggled after our ride. Our 26km ride had become a 38km ride and about 30km of that was in the rain, so I was feeling decidedly un-posh and more like a drowned rat! We rode our bikes around to our village room and dragged our wet and splattered panniers and bikes into its king sized interior and finally sat, had a rest, some lunch and dried off. “I think we made the right call,” said Steve as we looked out at the rain. Yes we did. It wouldn’t have been much fun putting up a tent in that and trying to get things dry in our damp tent. Sometimes it pays to be a bit soft! After a little rest, I then set off to make use of the gym and added a 10km run on the treadmill, to the day’s activity. It was a top day. It was wet, chilly and windy but it was grand! We lost the race against the rain, but boy, were we winners anyway. 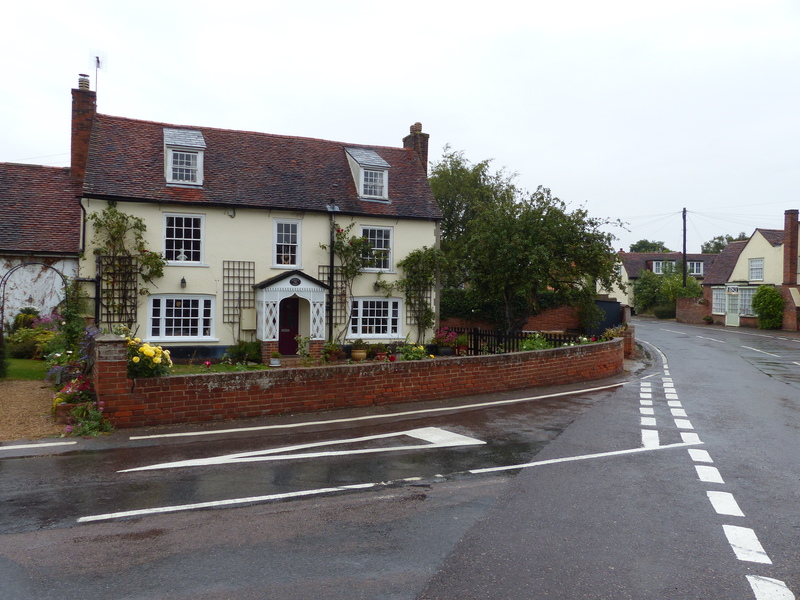 We had beautiful scenery, lovely country roads and lanes, countryside, some off-road paths, villages, a friendly tea room and a very comfortable, dry and warm room waiting for us at the end. That cheating rain might have won the race, but we got the gold medal for sure. I loved our ride today. Loved it! There’s been so much to love here and today, even the woolly weather could do nothing to change that. We are making the most of our remaining time here and days like this, just give us more golden moments. Darling England, you may have given us more winter weather on a summer’s day, but I hereby present you with the Golden Corgi Award for the exquisite experiences you keep delivering. Take a bow me darlin’. Take a bow. Happy, HAPPY days, my friend!! !